Lately my husband and I have been talking about going meatless more. It’s not a big streatch for me, I was a pseudo-vegetarian when we met and rarely ate meat just out of preference. My husband, however, is a die-hard meat and potatoes kind of guy-he’s never met a steak he didn’t like! Recently we were debating trying to go a month vegetarian when I suggested maybe we try once a week instead and he agreed. 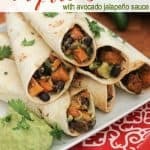 This amazing Sweet Potato and Black Bean Taquitos Recipe won him over though-they are hearty enough that you won’t even notice the meat is missing and the Avocado Jalapeño sauce add the perfect amount of kick balanced by smoothness! Seriously-ever since I started making these I rarely want meat taquitos anymore! My three kids even eat them which is saying a lot for them, they are super picky. I also like to use this mixture and sauce for my burrito bowls. 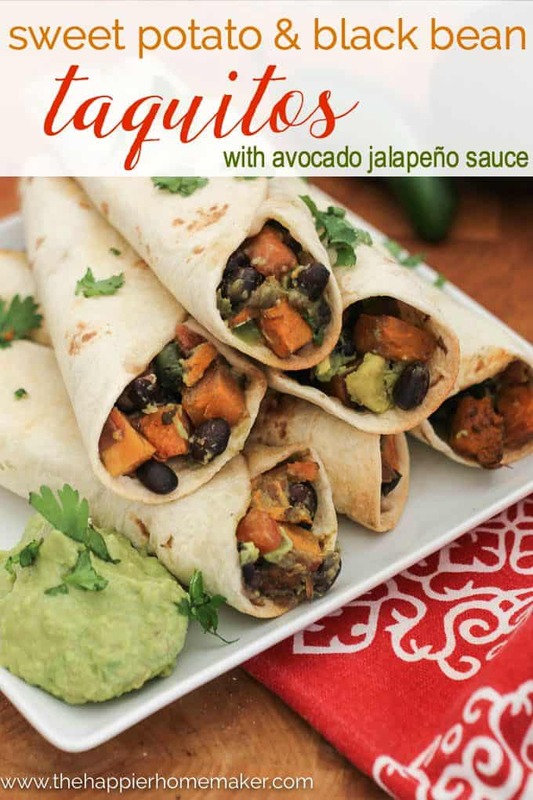 If you’re gluten free simply use corn tortillas to make this recipe work for you! So, would you give these a go for your Meatless Monday Night? If you try them please let me know what you think in the comments below-I’m excited to hear what you think! 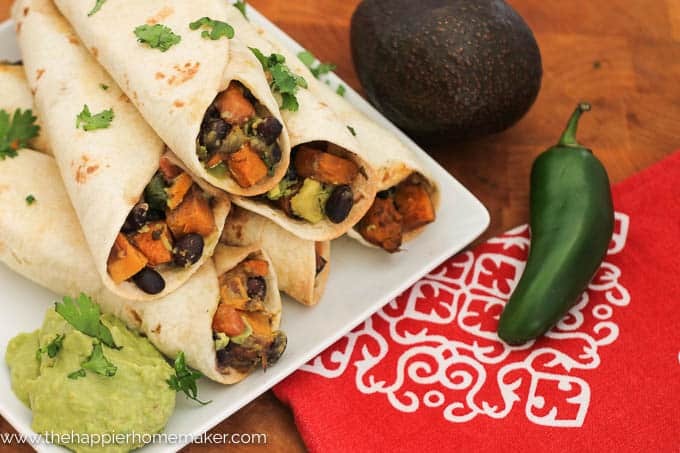 Try these hearty Sweet Potato Black Bean Taquitos for your next #MeatlessMonday meal! Dairy and meat free-simply replace the flour tortillas with corn tortillas to make the recipe gluten free as well! Allow the potato to cool enough to handle and cut into 1/2″ cubes. Meanwhile, combine avocado, almond milk, and jalapeño in a food processor and pulse until totally smooth. In a large bowl combine cubed sweet potato, beans, pico de gallo, onion, cilantro and 2/3 of the avocado jalapeño sauce. Spoon mixture into tortillas and wrap, placing on baking sheet seam side down. Bake for 20 minutes or until edges begin to brown. Serve with remaining avocado jalapeño sauce and garnish with cilantro. previous post: Halloween Wreath Inspiration!